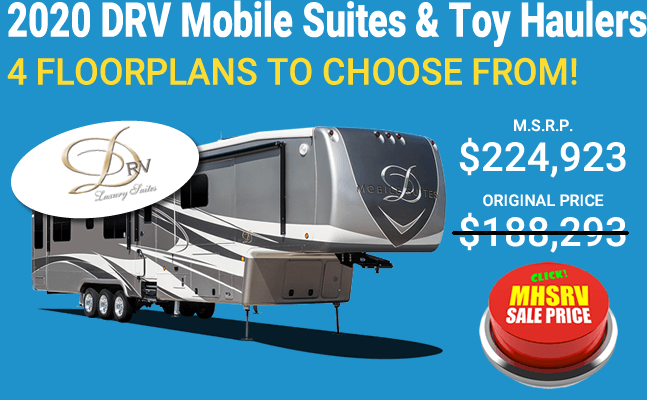 Forest River RVs for Sale at Motor Home Specialist, the #1 Forest River Diesel Dealer & #1 Forest River Georgetown Dealer. 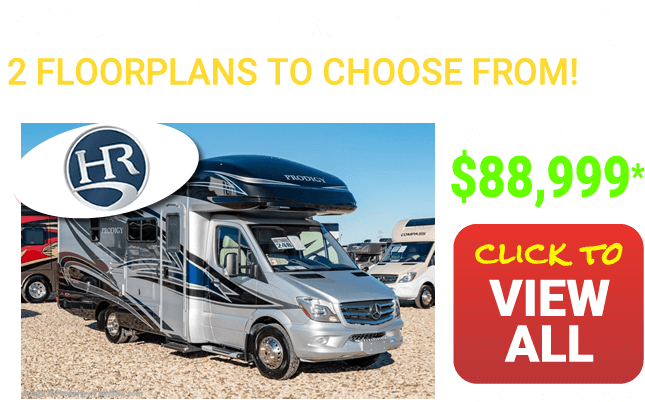 Motor Home Specialist has been a Forest River dealer for many years and is proud to be a part of one of the true industry leaders and trendsetters in the RV industry. 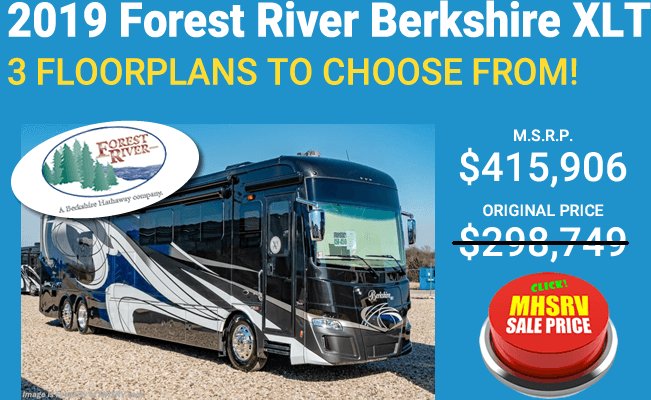 Forest River is a Berkshire Hathaway company and produces some of the most well-known models of class A gas and diesel pusher motorhomes ever produced. The Charleston has long been known for its unique floor plans and an incredible blend of both beauty and value. The Berkshire is, of course, the namesake luxury diesel pusher carrying the "Berkshire Hathaway" brand name. 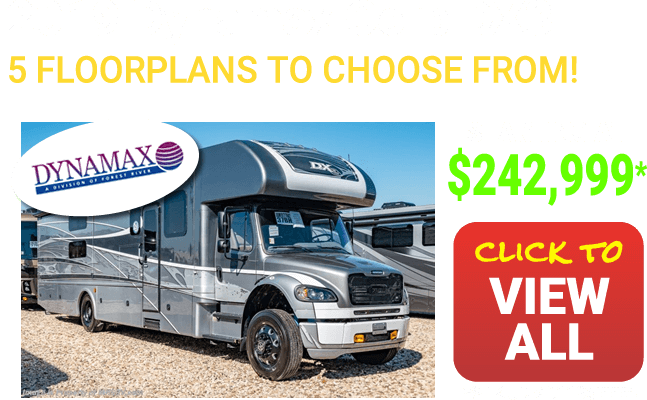 The Berkshire XLT is now the flagship model and is available with a tag axle model. 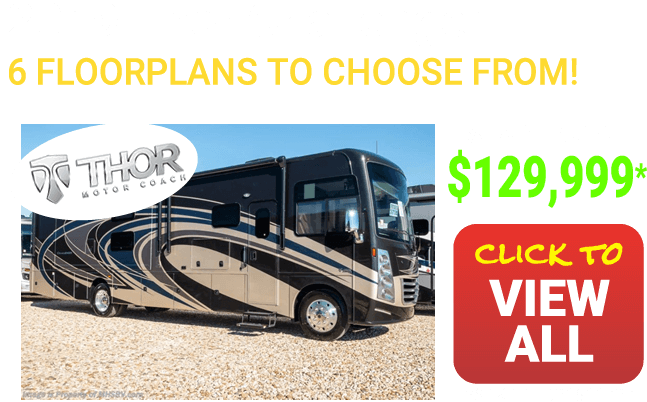 The Berkshire XL is the upgraded version of non-tag axle models over that of the incredibly popular and affordable brand of diesels that made the Berkshire one of the top-selling lines of diesel pusher RVs over the past 10 years. The Forest River Berkshire, Forest River Berkshire XL and now Forest River Berkshire XLT (T for Tag) models are all available in a host of family and couple friendly floor plans. 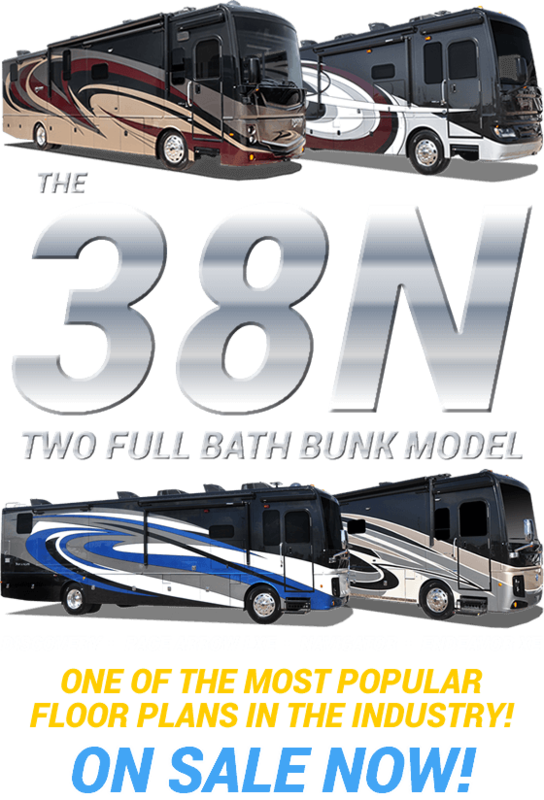 You will find everything from bunk model RVs with diesel pushers to compact 34-foot diesel pushers. The Berkshire was also one of the very first diesel pusher RVs to boast a bath and a 1/2 as well. 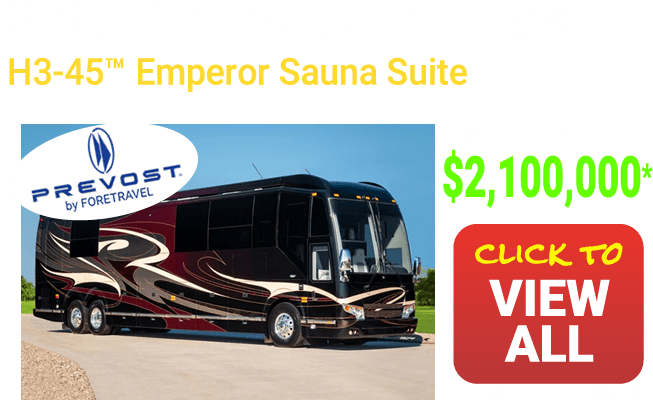 The Forest River Legacy is another popular model and rivals a high end class A gas motor home in price point. The Forest River Georgetown is perhaps the most sold class a gas motorhome period over the past 10 years. 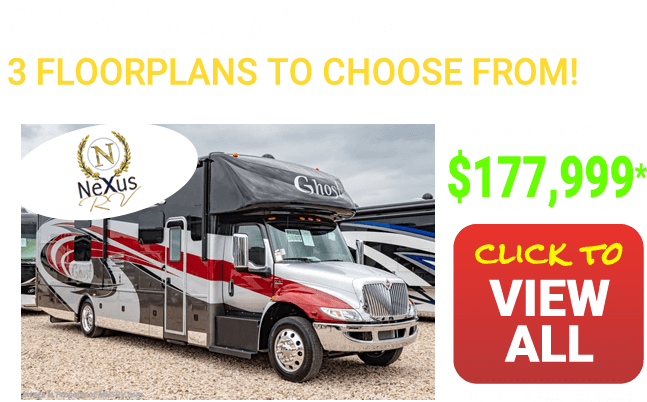 Its innovative floor plan designs and incredible attention to detail, feature benefits and value and made The Georgetown name legendary within the RV industry. The Georgetown brand is currently available in 3 levels of size and trim. The Forest River 3-Series or GT3 is an all new product meant to compete in the crossover section in the market place. Its unique styling, family friendly floor plans and the exceptional price point is sure to be a success. The standard Georgetown is available in a myriad of floor plans, colors and lengths. The Georgetown was even recently offered in the industry's first, to our knowledge, 2 full bath floor plan with bunk beds too! 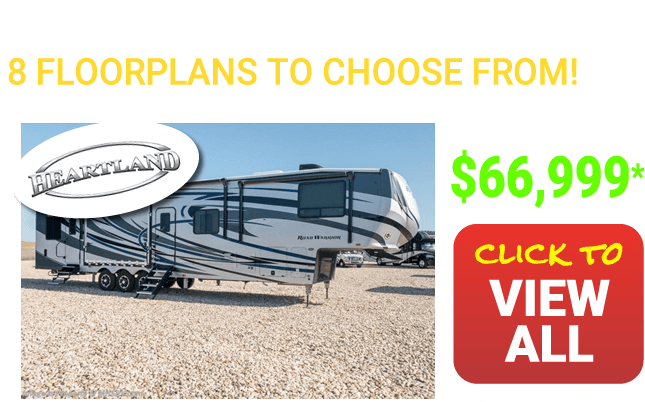 The Forest River Georgetown 364TS was Motor Home Specialist's top selling gas motor home floor plan in 2015 and it is off to another tremendous start. The 2 full bath arrangement is truly unique and after Donny O'Banion, the C.E.O. of Motor Home Specialist had Forest River add the necessary second water heater and water pump to better utilize both showers at the same time, its popularity with larger families has only increased. The Georgetown line is truly a great blend of value and innovation and an incredible buy when purchased at Motor Home Specialist. The Forest River Georgetown XL is the top of the line Georgetown model with available features such as 24-series Ford chassis, tile floors, residential refrigerators, solid surface counter, beautiful full body paint exteriors and an incredible line-up of popular floor plans including several bunk model RVs. The Forest River FR3 is another popular new offering from Forest River. The Forest River FR3 offers exceptional sleeping areas as well as living areas while keeping the overall length shorter than that of the average class A gas motorhome. 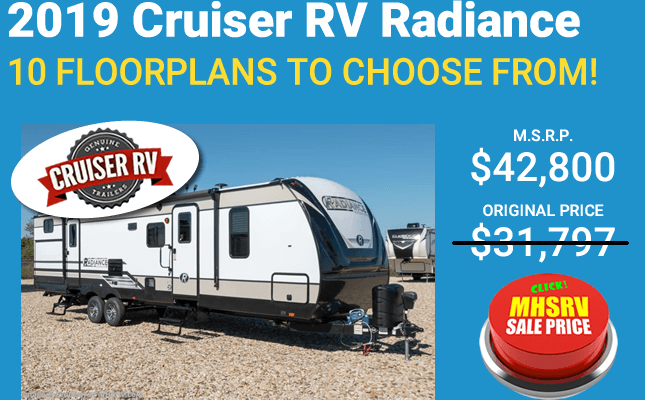 The FR3 is something that most would class in the Crossover segment of the RV industry. All of the Forest River models we have mentioned here are continually being enhanced and are ever-changing models with new floor plans and innovations being brought to the market place each year. 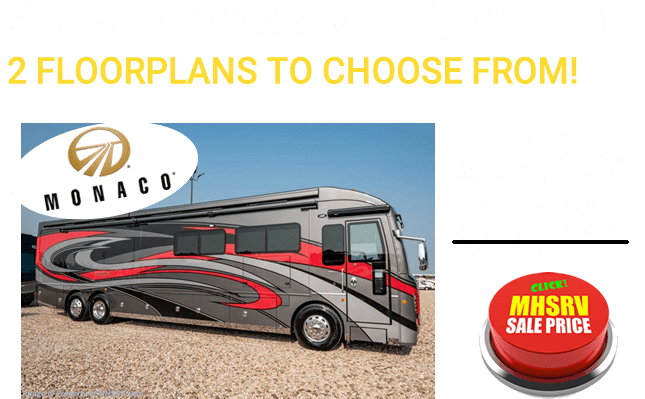 Be sure to check with a representative from Motor Home Specialist to get the most updated and comprehensive list of makes, models, features and more. Thanks you for visiting us at MHSRV.com - We all look forward to hearing from you soon. More about Forest River RV. It is hard to miss a Forest River motor coach on the road. It has that special something that is hard to put your finger on, but it is there. In this case, that something special is quality through and through. 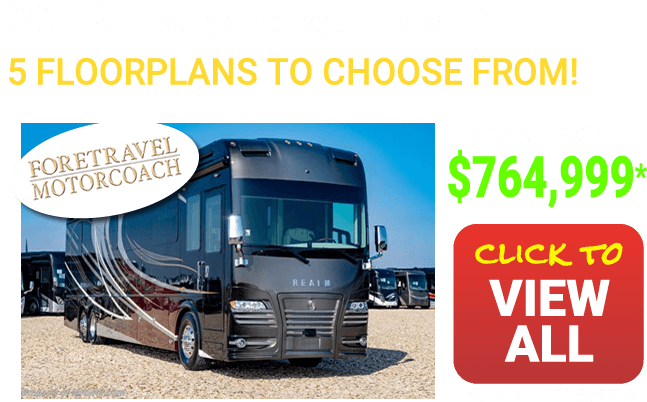 The goal of the team at Forest River is to make one of the finest motor coaches on the road time and time again, and that is exactly what they do. Find Out More About the Line of Forest River Motor Coaches. From the popular Berkshire to the stunning Charleston and the practical FR3, Forest River has got a little bit of something for everyone. 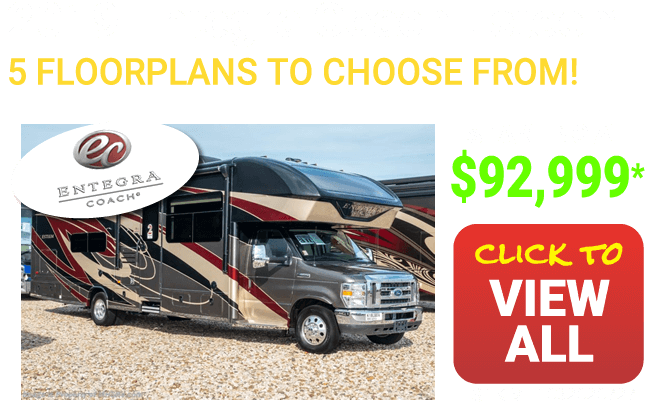 With ten coaches to select from and multiple floor plans and options, the choices are endless.  With these motor coaches, you will find one that fits your lifestyle to a tee. Are you a family with children? Forest River has got you covered. Maybe you are a retired couple looking to spend your golden years traveling, Forest River has got a coach for you as well. From plush carpeting and grouted tile flooring to cherry hardwood cabinets you'll feel as if you have stepped into a wonderland when you step into your new Forest River motor coach. 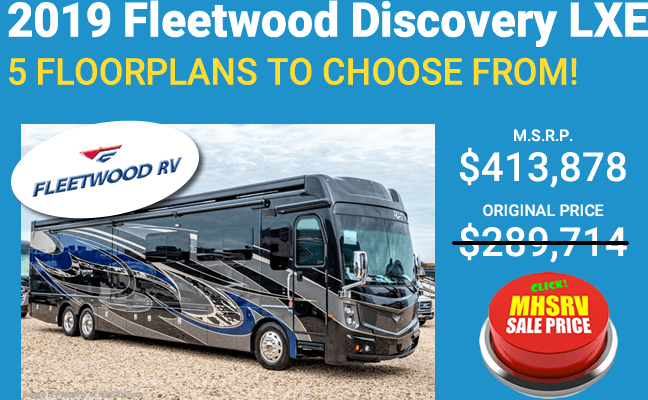 Determine Which Options Work the Best for You in a Forest River Motor Coach. 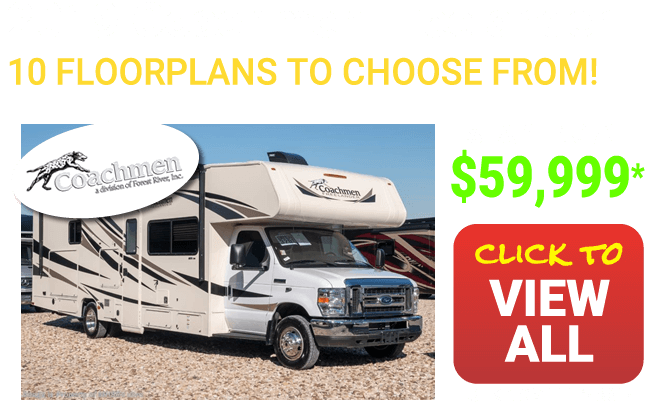 With all of the standard features, and the extra ones to select from, you will feel as if your new motor coach has been custom designed just for you. Maybe you need extra sleeping areas - no problem, just add on the extra bunk over the driver's cockpit in select models. Instead, perhaps you need extra counter space to cook larger meals or bake that special birthday cake? No problem with the fixed island and stainless steel sink that provides extra workspace. Forest River RV Amenities may include: residential refrigerator, tile floors, fiberglass roof, leveling systems, 3-camera monitoring systems, washer/dryers, power drop down bunk, solid surface counters or exterior entertainment centers. 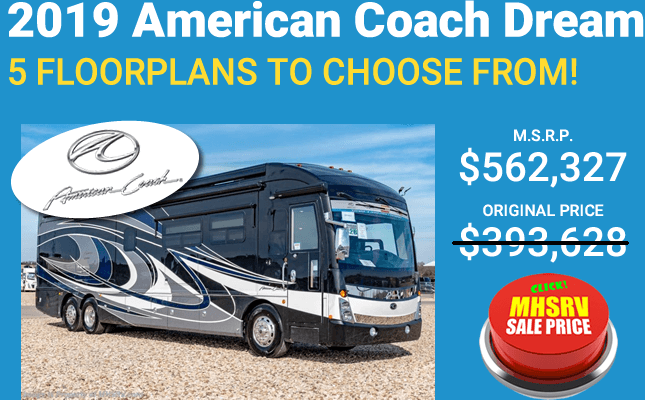 Connect with Motor Home Specialists for Your New Forest River Motor Coach. 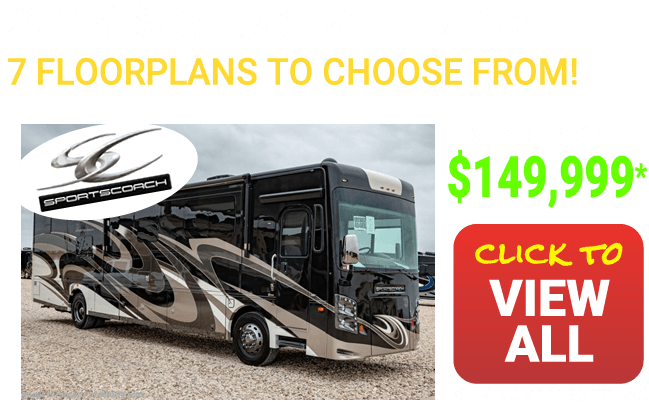 There is no one on the planet that loves motor coaches as much as our team at Motor Home Specialists, and there is no one else that knows motor coaches quite as well as we do either, so when it is time to buy your very own Forest River coach, give us a call. In fact, give us a call today. Thank you for visiting us at MHSRV.com - We all look forward to hearing from you soon.